A commonly-accepted notion in Western astrology is that when Mercury goes retrograde, as happens three times a year for roughly three weeks at a time, things go terribly wrong for people. But if that’s really true, shouldn’t it be reflected in events when hundreds – perhaps thousands, or even hundreds of thousands – of people had a really bad day, so bad they died? Not knowing what I’d find, I examined the 60 worst disasters on record to see if there were any common astrological factors, particularly whether Mercury was retrograde at the time of the event. And by “worst” I mean those with the highest death tolls within each category of disaster. Natural disasters comprise earthquakes, typhoons, floods and tsunamis. These are the most deadly natural phenomena, and in the top 15 natural disasters of all recorded time, they’ve claimed 138,000 to 3.7 million victims per event, for a total of 8.7 million fatalities. Maritime disasters involve loss of life on passenger ships and ferries. 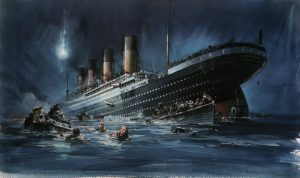 The Titanic is only the most famous, not the most deadly, of such tragedies. The top 15 maritime disasters have drowned 1,000 to 4,386 people per sinking, for a total of 27,000 deaths at sea. Rail disasters typically involve the derailment of passenger trains, or their head-on collision with other trains. In the last 100 years, these major mishaps have killed anywhere from 320 to 1,700 people per train wreck, for a total of 9,000 fatalities. Air disasters typically involve the downing of commercial airliners. These have all occurred within the past 45 years during which the size of aircraft has placed larger numbers of passengers at risk. These crashes have killed anywhere from 261 to 583 travelers per incident, for a total of almost 5,000 deaths. I first identified the top 15 disasters (ranked by death toll) within each of these four categories: natural, maritime, railway, and aviation. I then prepared charts for each event and ranked by frequency the astrological features for these events, first within their respective categories, and subsequently in total for all disastrous events in the study. I used sidereal positions, but since my analysis involved only aspects and retrogression, the results are (largely) independent of zodiacal sign. 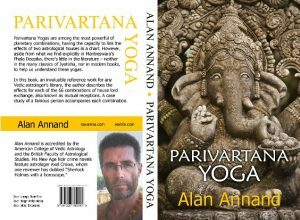 In total, I examined 16 different astrological factors across these 60 disasters. Mercury retrograde is just one of those factors. The other 15 are the “hard” aspects between the Sun, Moon, Mars, Jupiter, Saturn and the nodal axis. Hard aspects comprise conjunctions, squares or oppositions. Most astrologers agree that “soft” aspects – sextiles and trines – correlate with benign conditions and circumstances, whereas hard aspects typically accompany difficulties of some kind, eg, disasters. Although one could argue that the exclusion of hard aspects to Mercury and Venus constitutes something less than a full review of the astrological factors in disasters, my rationale was as follows. First, I was primarily interested only in knowing how prevalent was Mercury retrograde in these events, and to do that, I needed only a modest number of other factors for comparison purposes. To add more planets (inferior or trans-Saturnian) or use Ptolemaic aspects would only serve to complicate the matter. In a nutshell, popular astrological wisdom says that bad things happen during Mercury retrograde. The purpose of this study was simply to test that thesis. On average, Mercury goes retrograde three times a year, with each period lasting about three weeks. More specifically, we’re informed in Jeff Mayo’s The Astrologer’s Astronomical Handbook that “in a synodic period of 116 days, Mercury retrogrades for an average of 22 days.” That’s roughly 19% of the time. Therefore, in 60 disasters, we’d expect to see Mercury retrograde in about 11 of them (60 @ 19% = 11.4). The other astrological factors considered in this study are the hard aspects between the Sun, Moon, Mars, Jupiter, Saturn and the nodal axis. Therefore, in order to subsequently assess the results, we must consider how frequently they occur on average. For instance, if we take Saturn as a stationary object, how often will those other planets form a hard aspect with it, ie, a conjunction, square, or opposition? If Saturn sits in Libra, for example, the Sun will form a hard aspect with it four times in a year – an opposition from Aries, squares from Cancer and Capricorn, and a conjunction in Libra. In other words, the Sun will form a hard aspect from four signs out of 12, ie, one in three, or 33% of the time. And in fact, these odds are more or less the same for any faster-moving planet in its orbital cycle to form a hard aspect with any slower-moving planet. Therefore, if we have 60 events, it would be normal to see hard aspects between any chosen pair of planets 33% of the time, or 20 occurrences for each pair. 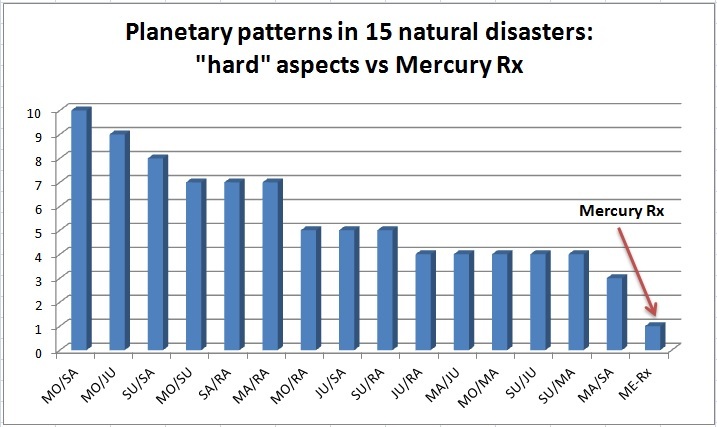 Of the 15 natural disasters included in this study, Mercury was retrograde in only one of those events, and was in fact the least-occurring astrological factor among those included for analysis. Recall that Mercury is retrograde roughly 19% of the time; therefore in 15 events it should have turned up roughly three times (15 @ 19% = 2.85). As for “hard aspects” between planets, recall also that for any two planets to form a sign-to-sign hard aspect, the chances are 33%. So in 15 events, we would expect five occurrences for any given pair of planets. As we can see from Graph 1 below, hard aspects between Moon/Saturn, Moon/Jupiter and Sun/Saturn were more predominant in natural disasters. Can we draw any conclusions from this observation? Only that the Moon is the greatest influence on tides of atmosphere, ocean and tectonic plates, and that Saturn rules earth-shaking events. Known in the Philippines as Typhoon Bebeng, Nina was the fourth-deadliest tropical cyclone on record. After making landfall in Taiwan with winds of 115 mph and gusts of 138 mph, it crossed the Formosa Strait to mainland China. Blocked by a cold front, it became a stationary thunderstorm whose 3-day torrential rains overwhelmed the Banqiao Dam which received 1-in-2000-year flood conditions. Like dominoes, 61 other regional dams collapsed, killing 229,000 people. The Moon is in a tight conjunction with Mars in Aries. Jupiter is associated with them in the same sign. All three are in sign-to-sign square with Sun and Saturn in Cancer. 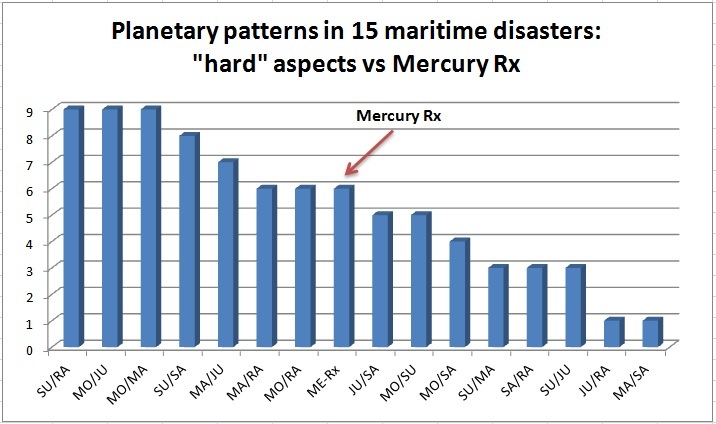 Of the 15 maritime disasters included in this study, Mercury was retrograde in six of those events, twice as prevalent as the three occurrences expected on average. Although hard aspects between Sun/Rahu, Moon/Mars and Moon/Jupiter were actually more predominant in maritime disasters, we must also keep in mind that, notwithstanding their frequency, they are somewhat less than twice as prevalent as expected on average. If we can conclude anything from this observation, it is that Mercury retrograde seems to have played an out-sized role in maritime disasters. On 20 December 1987, the Philippine passenger ferry Doña Paz collided with an oil tanker carrying a cargo of gasoline. Seriously overcrowded, the ferry had no radio, and its life jackets were all locked up. Upon collision, the tanker’s cargo ignited and spread to the ferry, which sank within two hours. Passengers were forced to leap into shark-infested waters, struggling to stay afloat in a sea of dead bodies and burning gasoline. With an estimated death toll of 4,386 people and only 24 survivors, it was the deadliest peacetime maritime disaster in history. The Sun, Moon, and Saturn were in the same sign, all square to Jupiter (in its own sign) and the nodal axis. 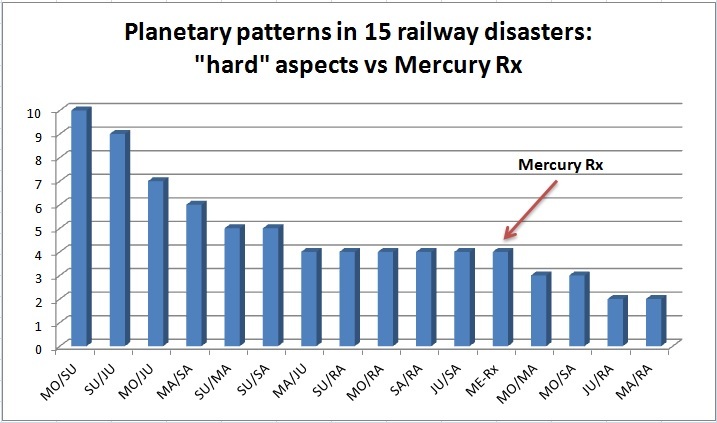 Of the 15 railway disasters included in this study, Mercury was retrograde in four of those events, slightly more than expected on average. Hard aspects between Sun/Moon, Sun/Jupiter and Moon/Jupiter lead the pack in railway disasters, only the first of which is twice as prevalent as expected on average. Hard aspects between Mars/Saturn come in fourth. Although mechanical failures (track infrastructure, signal systems, brakes, etc) are often to blame in railway accidents, this astrological factor is nonetheless scarcely above the average expected. In December 1917, a troop train was carrying 1,000 French soldiers home for Christmas leave from the Italian front in WW1. Short of locomotives, the commanding officer for rail traffic coupled 19 coaches to a single engine. The train driver refused to drive the overloaded train, but was forced at gunpoint by the officer to proceed. As the train descended the Maurienne valley, the brakes had no effect on the heavy load, and the driver lost control. After rocketing down the mountain at up to 84 mph, the first coach derailed, causing a massive pile-up and resultant fire, killing 700 troops. The Moon was dark and waning, in the same sign with the Sun. Both were opposed Jupiter, and all three in sign-to-sign square with Mars, which was in mutual reception with the Sun. 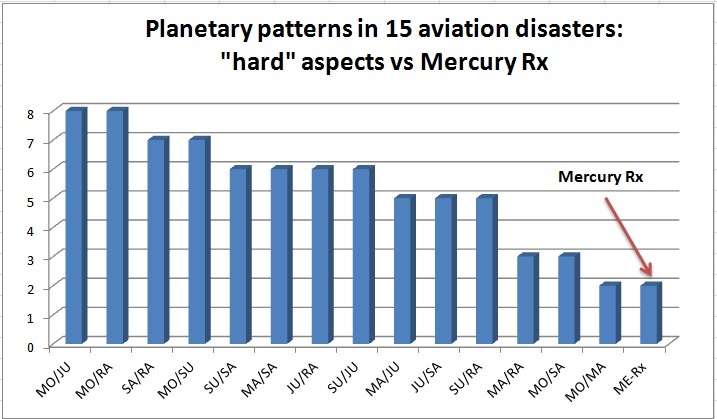 Of the 15 aviation disasters included in this study, Mercury was retrograde in only two of these events, less than expected on average. Hard aspects between Moon/Jupiter and Moon/Rahu are the most commonly-occurring aspects in aviation disasters, yet neither is significantly more prevalent than was expected on average. Hard aspects between Sun/Moon and Saturn/Rahu follow close behind, but again with unremarkable significance. Notwithstanding this lacklustre showing, we might still note the participation of the Moon’s nodes (Rahu and Ketu, North and South Node, respectively) in two of the four most common factors. The North Node Rahu is commonly associated with aviation, as well as sudden events. On 12 August 1985, on a domestic flight from Tokyo to Osaka, an explosive decompression on a Boeing 747 ripped off a large portion of its tail. The plane lost its hydraulic controls and crashed, killing 520 people on board. The accident was attributed to a faulty repair performed by Boeing after a tail-strike incident during a landing seven years earlier. It is the deadliest single-aircraft incident in history, and the second-deadliest aviation accident, behind the 1977 Tenerife disaster when PanAm and KLM airliners collided on the airport runway. The crash chart features a full moon, a debilitated Mars and Jupiter, and an exalted Saturn, all in mutual hard aspect with the Sun and the nodal axis. Mercury is also retrograde. To summarize the results of these four disaster categories, the astrological factors in play are presented by order of frequency in Graph 5 below. The first thing we should note is that Mercury retrograde is one of the least-frequently-occurring of the 16 astrological factors present at the time of a disaster. But how “infrequent” is that? As it turns out, Mercury was retrograde during 13 of these 60 disasters. This is a relatively small sample when compared to rigorous statistical studies, but we can still apply simple math to get a rough idea of its significance. 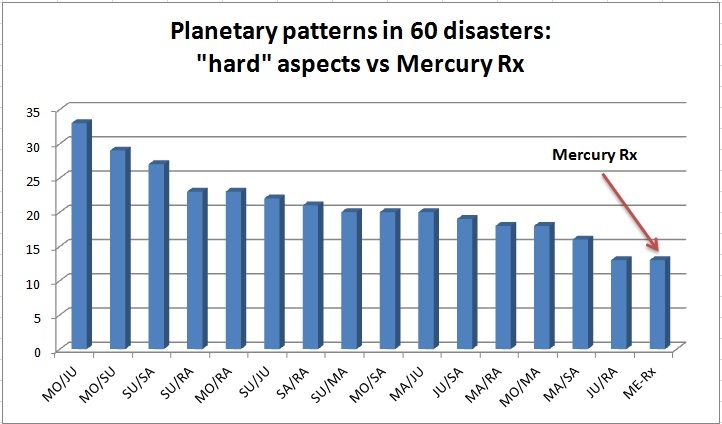 Recall from the earlier section on Expectations that, in 60 disasters, we expected to see Mercury retrograde in about 11 of them (60 @ 19% = 11.4). In other words, with Mercury retrograde in 13 of these incidents, against an expectation of 11 such occurrences, we could say that Mercury retrograde has exceeded expectations by 18%. How does that compare in significance to the other 15 astrological factors, ie, the hard aspects among the Sun, Moon, Mars, Jupiter, Saturn and the nodal axis? Again, referring back to the section on Expectations, we noted that any of these planetary pairs would form a hard aspect 33% of the time. In 60 events, that means we’d expect Sun/Moon, or any other planetary pair for that matter, to form a hard aspect 20 times. If we examine Graph 5 below, we see that roughly half of the planetary pairs appear as per average expectations (n=20), give or take an event. Three of these planetary pairs (Moon/Jupiter, Moon/Sun and Sun/Saturn) appear with greater frequency, while two pairs (Mars/Saturn and Jupiter/Rahu) appear with less frequency. Now, instead of looking only at the raw number of occurrences (ie, hard aspect of some planetary pair vs Mercury retrograde) over these 60 events, I re-plotted this data in Graph 6 to illustrate a “significance” index. This acknowledges the fact that we expect Mercury to be retrograde 11 times in a study of 60 events, but we expect a hard aspect between any planetary pair to occur 20 times in 60 events. In other words, based on pure numbers alone, a hard aspect between any planetary pair is on average twice as likely as Mercury being retrograde. Thus, the “significance” index for a planetary pair is equal to X observed occurrences of a hard aspect between that pair, divided by 20, the expected number of occurrences for a study of this size (n=60). 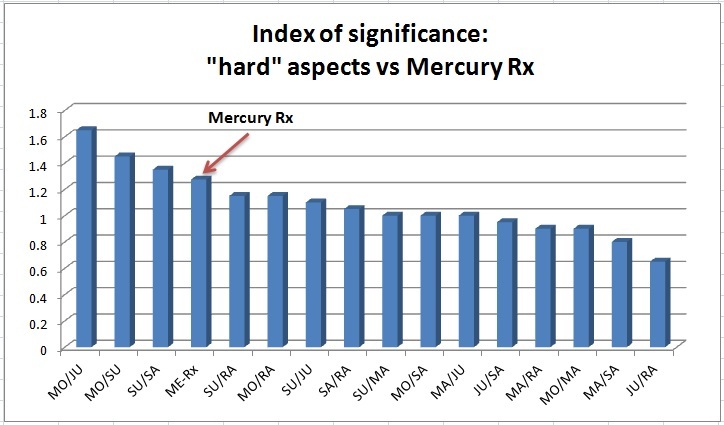 Similarly, the “significance” index for Mercury retrograde is equal to Y observed occurrences of Mercury retrograde, divided by 11, the expected number of occurrences in a study this size. As can be seen from Graph 6, the most significant astrological feature in disasters is a hard aspect – conjunction, square or opposition – between the Moon and Jupiter (n=33). This pattern was present in 55% of these disasters. Furthermore, these Moon/Jupiter aspects occurred 65% more frequently than expected. The second most significant astrological feature is a hard aspect between the Sun and Moon (n=29). This pattern was present in 48% of these disasters, and occurred 45% more frequently than expected. The third most significant feature is a hard aspect between the Sun and Saturn (n=27). This was present in 45% of these disasters, and occurred 35% more frequently than expected. The fourth most significant feature is Mercury retrograde (n=13). Although this occurred in only 22% of these disasters, it was observed 18% more frequently than expected. Meanwhile, at the far end of the scale, the least significant feature is a hard aspect between Jupiter and the nodal axis (n=13). This was present in only 22% of these disasters, and occurred 35% less frequently than expected. Admittedly, this is a relatively small (n=60) number of events upon which to draw any firm conclusions. However, as a test of the thesis – Is Mercury retrograde significant in disastrous events? – this study would seem to suggest a very modest correlation. Mercury retrograde was present in 13 out of 60 disasters, which is roughly 18% more often than expected. However, other astrological factors appear to be more significant. Hard aspects between Moon/Jupiter, Moon/Sun and Sun/Saturn appeared even more frequently than expected – 55%, 45% and 35%, respectively. Are these numbers statistically significant? To answer that question may require a statistician (which I am not) and a study that incorporates a much larger number of disasters. In the meantime, however, we may wish to comfort ourselves that the regular recurrence of Mercury retrograde in our astrological calendars should not provoke the anxiety that is so typically stoked by some practitioners. We might just as well fear hard aspects between the luminaries and the two largest planets. For those of morbid inclination, we can now envision a “disaster clock” in which there are four hands – Saturn, Jupiter, Sun and Moon. When the hands align, oppose or square each other, trouble looms. Jupiter and Saturn are in hard aspect for a year at a time. Within that year, the Sun will be in hard aspect with both Jupiter and Saturn every three months – for a month at a time. Within any of those months, the Moon will be in hard aspect with all three – Sun, Jupiter, Saturn – for a couple of days each week. But if Mercury is also retrograde at the same time, maybe you really should stay home.